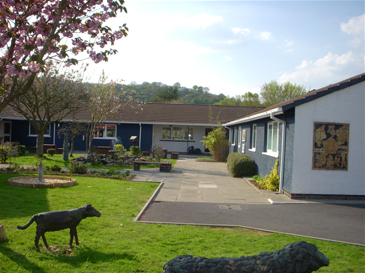 Our school was opened in 1976, a design/building project between the Department of Education and Science in London, The Welsh Office and Dyfed County Council. Five small village schools were closed in order to provide a wide and rich opportunity for us children to learn and play together. In 1984, Ysgol Gynradd Gartheli in Llwynygroes closed and the children of the village started attending Ysgol y Dderi. Our school is a community school with seven classes from the Nursery to Year 6. We are a happy school with a capacity for 144 children. The school hall is the heart of our school, where we meet twice a week for collective worship. It is also used for Physical Education and school dinners. We have playgrounds within the Foundation Phase and junior department which are lively and colourful, with many fun and stimulating activities for us. In addition we have a field, an activity area, and we are also very lucky to share the village play area with the community. Our forest field is an important space, where we learn many new skills and apply many of those we have learnt in the classroom. A fenced area is our garden where we cultivate fruit and vegetables. We are also involved with the Long Wood Project, a local community forest where we have planted trees and participated in Forest School initiatives.